A friend recently called to ask the name of the shovel we use to remove snow. It looks like a sled pushed by a bar, and it moves tremendous amounts of snow quickly. Years ago I may have been stumped by the question. I may have gone to look at the shovel and found, as in this case, that its name was not stamped on the handle. I may have tried to remember the name of product and the store at which I purchased it. Even if we could remember that information, our friend may have found the product no longer available at a store near her. But, this is not years ago; and we were able to find the answer very quickly. Why? I had purchased the product—the Suncast Big Scoop—at Amazon. As a consequence, within minutes, I was able to provide our friend the link to the shovel at Amazon; and she was able to order the product that same day without doing hours of her own research. Indeed, if I am asked, I can tell you the date of my very first purchase at Amazon. It was March 6, 1997; I purchased four books for $57.01. How do I know? Amazon keeps the records for me and makes them readily accessible. The same week, I needed to retrieve information for taxes. When I went online to my bank account, I found that the bank maintains only six months of my banking records. The cost of server space to maintain records is basically the same for the bank as it is for Amazon—zero. Amazon chooses to make my shopping experience almost always delightful, and my bank choose otherwise. During the 1996 Summer Olympic Games, my brother visited. He works in a technology field, and my wife remembers that he and I had a heated discussion about the commercial viability of Amazon. Amazon had sold its first books online in 1995, and my brother was certain they were doomed for failure. I thought otherwise; but unfortunately, when Amazon went public in May 1997, it didn’t register with me to begin to accumulate their stock. In his seminal monograph Profit and Loss, Ludwig von Mises observes, “If all people were to correctly anticipate the future state of the market, the entrepreneurs would neither earn any profits nor suffer any losses.” Of course, it is literally impossible for that to happen; and that’s why there are disagreements about the viability of emerging companies. Von Mises goes on to point out in Profit and Loss, “Profit and loss are generated by success or failure in adjusting the course of production activities to the most urgent demand of the consumers.” Yet, if you asked the management of my bank, they would tell you that they are as interested as Amazon is in meeting my most urgent needs. My bank, like almost any organization, would explain how they are committed to customer service. They would be blind to the fact that they don’t deliver. This statement is operationally meaningful. Would a bank that cares about the lives of its customers post just six months of banking statements in order to save pennies in online storage space expense? The answer is of course not. Patnaik gives the example of Harley-Davidson, a company that mandates “that leaders throughout the organization spend measureable amounts of times out with motorcycle riders.” No, they don’t mandate that their leaders ride a motorcycle—just that they take steps to increase their empathy for their customers. There is no formula for how an organization creates a culture of empathy for their customers. But genuine willingness to be empathetic begins with a willingness to give before receiving. Most organizations cannot even get to the starting gate for a culture of empathy because there is no willingness to do the inner-work necessary to examine the dysfunctional beliefs that prevent empathetic behavior. What are these dysfunctional beliefs? At their core is the belief in a static, win-lose world. In a static, win-lose world, receiving must come before giving, or at best, business is conducted like a hostage trade off—We’ll give you something, if give us something of the exact same or greater value. The individuals who work in such organizations battle with their colleagues to get ahead. What about me? is the mantra repeated silently throughout the day. Why aren’t more organizations empathetic with customers? One could easily ask why aren’t more people empathetic with other people? The answer is very clear: When one chooses their ego for guidance, the world is evaluated through the ego’s lens whose central concern is What about me? The guidance that follows from that question is sure to be stingy and uncaring. 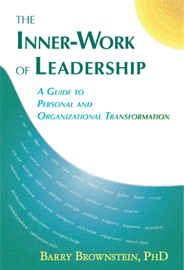 In my book The Inner-Work of Leadership I provide specific guidance for recognizing our ego and turning away from our ego. Importantly, I cover the specific ingredients that are necessary for an organizational culture to evolve to support the inner-work journeys of their employees. In a declining economy and an increasingly competitive global marketplace, an organizational culture of empathy with the customer is no longer optional: no empathy, no profits. Today it was announced that Kenneth Feinberg, the Treasury Department’s special master for compensation, “will slash compensation for the 25 highest-paid employees at seven firms receiving large sums of government aid.” In a free-society, there is no room for a “compensation czar;” the problem will be gone instantly when the aid is eliminated. There are only two ways for men to acquire wealth. The first method is by producing a good or a service and voluntarily exchanging that good for the product of somebody else. This is the method of exchange, the method of the free market; it’s creative and expands production; it is not a zero-sum game because production expands and both parties to the exchange benefit. Oppenheimer called this method the “economic means” for the acquisition of wealth. The second method is seizing another person’s property without his consent, i.e., by robbery, exploitation, looting. When you seize someone’s prop­erty without his consent, then you are benefiting at his expense, at the expense of the producer; here is truly a zero-sum “game”–not much of a “game,” by the way, from the point of view of the victim. Instead of expanding production, this method of robbery clearly hobbles and restricts production. So in addition to being immoral while peaceful exchange is moral, the method of robbery hobbles production because it is parasitic upon the effort of the producers. With brilliant astuteness, Oppenheimer called this method of obtaining wealth “the political means.” And then he went on to define the state, or government, as “the organization of the political means,” i.e., the regularization, legiti­mation, and permanent establishment of the political means for the acquisition of wealth. What good is a theory if it is not applied? I don’t know if Max Keiser has ever read Oppenheimer or Rothbard, but listen to Keiser as he colorfully explains the differences between firms like Google who earn their wealth through production and the banking industry who he explains has obtained its wealth through theft. Is this mere hyperbole on Keiser’s part? While I can’t say, as Keiser does, that accounting fraud is currently being committed by the banks, I can say that the bonuses being paid would not be paid on a free market. These bonuses are being financed, in part, by direct transfer of taxpayer’s money and by record low interest rates that indirectly transfer resources from productive savers into the hands of banks and debtors. The latter is a direct consequence of Federal Reserve policy. “An analysis of Mr. Geithner’s calendars…shows that Mr. Geithner had contact with top executives at Citigroup, Goldman Sachs and JPMorgan Chase more than 80 times during his first seven months at Treasury.” Source here. “Goldman Sachs posted near record trading profits in the third quarter of 2009. The projected 2009 Goldman Sachs bonus pool will be around $20 billion, a near record amount. Therefore the average pay out per employee could be more than the $661,490.” Source here. “As a whole financial firms “accounting for more $350 billion in federal bailout funds, increased these perks and benefits 4 percent on average last year, according to an analysis of corporate disclosures filed in recent months.” Source here. Without government bailouts, these result would not have been possible—failing firms do not pay bonuses. None of this is to say that officials like Treasury Secretary Geithner are evil individuals who are consciously trying to undermine the American economy. Instead, perhaps Geithner has his own form of cognitive dissonance as he tries to internally justify his behavior. He may begin with a truth that a healthy banking system is essential to the American economy; and then, he may resolve his dissonance by adding the false premise that JPMorgan, Chase, Citibank, etc. are essential to a healthy banking system. Nothing could be further from the truth. The financial institutions that are being subsidized took reckless risks. The economy cannot have a sustained recovery until those firms which made bad loans and who can not survive without government assistance are liquidated. Nothing in the conduct of these financial institutions suggests that they have reformed. They will continue to seek the political means to wealth; and like a drug addict who would destroy his family before giving up his habit, they and their government enablers will do the same to America. And when they are through, they will relieve their cognitive dissonance by chanting the big lie—there was nothing else we could have done. Mortgage modification legislation is currently moving through Congress; the bill allows bankruptcy judges to reduce the principal as well as the interest rate on an outstanding loan. Consider the case of a homeowner who, after their home purchase, experienced an initial strong upturn in the value of their house. Flush with equity and assured by experts that the value of their home would go up forever, they took out a home equity loan and spent the proceeds on clothing, jewelry, vacations and a new SUV. Now that housing values have gone south, they file for bankruptcy; and a judge reduces the principal on their home loan. What has been consumed already, via the equity loan, the homeowner keeps. The rest of us pay the bill. Would you want to be a lender when these are the rules? To compensate for increased risk to lenders, interest rates of all kinds will go up; indeed the market for some types of loans may dry up completely. No matter, Congress will pass another fix for that. Most importantly, a prime principle that built America—namely, that we honor the contracts we sign—will turned into a national game of how we can avoid honoring our contracts. As more people play that game, our principles will erode and the economic depression will deepen; we will all pay the price. Since Congress and the President seem determined to do everything in their power to turn us into a third world country, let’s learn from a country like Bangladesh. Dr. Muhammad Yunus is a Nobel laureate from Bangladesh. Dr. Yunus’s great genius was to figure out a system that would allow for poor but entrepreneurial minded Bangladeshis to borrow money and start a business. These loans are not collateralized; yet, over 98% of the time, these loans are paid back in full. How? Each applicant has to form a team with four other applicants, and they each have to cosign for each other’s debt. Given that, you can be sure that business plans are carefully scrutinized by the cosigners. No loan modifications granted for homes which are above 1500 sq. ft. If your home is larger, you need to downsize first. No occupant of the home can own or lease a car valued above $10,000. No occupant can own flat-screen televisions or subscribe to cable television. No occupant can take a vacation away from their home. No one can eat out. No purchases of processed food would be permitted. This reduces the family’s food budget. It also lessens the chance of an illness which could interfere with paying back the loan. Non-food purchases above $100 would have to be approved by the cosigners. Pretty draconian? Very few would apply? That’s the idea. And yes, I would apply the same terms to everyone in Congress who votes for the mortgage modification bill. After all, they too are spending other people’s money and should be bound by the same terms. I was in graduate school in the 1970s. My car was a Plymouth Duster. If the weather was wet and rainy, the choke in the carburetor would stay tightly closed. To start the car, I would hold the choke open by sticking a pencil in the carburetor. It could have been worse; I could have owned a Fiat. Many mornings, my friends who owned a Fiat would call me up and asked me if I could drive them to work. The number of systems that were continually failing in their Fiat was staggering. In comparison, I felt fortunate to own a Chrysler. In 1982, in part because of the poor quality of their cars, Fiat fled the American market. Just what Americans need—the marriage of Chrysler and Fiat engineering! In normal times, when we are not facing the human suffering caused by failing businesses, we could be amused by the buffoonery of these automobile executives. But these are not normal times and here is the punchline for the taxpayers—“the deal between Chrysler and Fiat becomes binding only if Chrysler gets $3 billion more in financial help from Washington.” In other words, via Chrysler, Italian automakers will pick our pockets too. I have railed against all types of useless government expenditures, but this ranks high on my outrage scale. In a shrinking automobile marketplace, the probability of success for a marriage of two of the worst automakers on this planet is zero! Mutt and Jeff was the first daily comic strip in the United States. The characters were misfits who were constantly involved in get-rich-quick schemes. The strip ended its run about the same time Fiat exited America. This alliance between Fiat and Chrysler is a Mutt and Jeff type of get-rich-quick scheme hatched by their executives. Look for the private holders of Chrysler—Cerberus Capital Management—to take this taxpayer money and run with it like common thieves by trying to unload their stake. Yes, thieves. There is no way that American taxpayers would voluntarily give $3 billion to support a Fiat/Chrysler alliance. What’s next? Mandatory purchases of their cars? My son, an aspiring comic author/artist, advises me that my comparison of Chrysler and Fiat to Mutt and Jeff is unfair. Mutt and Jeff may have been scheming for the quick buck, but they weren’t thieves. With most pundits assuring us that the stock market has hit its bottom and with a new president about to take office, many have a great hope that the worst of the economic crisis is behind us. That the worst is behind us is almost certainly false. As the famous line goes, “It’s hard to make predictions—especially about the future.” With that in mind, here is how I see 2009. Of course, I must issue the traditional caveat—that the following is not intended to be investment advice. Market timing is an incredibly difficult art and very few have been successful at it over the long-term. The truism in that last statement has been used by many who advocate a buy and hold strategy. However, a buy and hold strategy in this current environment is very problematical. Home Prices: After falling about 20% last year, home prices are back to their March 2004 levels. In history, there has never been a bubble that ended before prices had fallen to below pre-bubble levels. It is hard to date the beginning of the housing bubble; but if we say it began somewhere around 2000, clearly housing prices will be falling much farther from here. Survey after survey shows that the average homeowner believes that their home has not fallen in value; housing will not be at the bottom until this psychology turns. Houses are something you consume; they are not something to invest in. Like a new car, a new house begins to fall apart from the moment you purchase it. When the average individual realizes that truth, we will be at the bottom. Stocks: Despite the tremendous amount of liquidity that the Fed has been injecting into the system, deflationary forces are for the moment stronger. The stock market is almost certainly not at its bottom. Extreme excesses cannot be corrected in a single year, particularly when the government is doing everything it can do to prevent the liquidation of bad assets. Nothing goes straight up or straight down; and it is very likely that in 2009, within the continued bear stock market, there will be at least one very powerful countertrend rally. As the 1930s demonstrated, great fortunes can be made in a short time by those individuals who are smart enough or lucky enough to trade those countertrend rallies. The obvious corollary is that you can lose a lot of money in a short time if you are wrong. Commodities and Inflation: For now oil and other commodities have succumbed to deflationary pressures. However, the Fed has injected an unprecedented amount of money into the banking system. According to Robert Higgs “since August, the amount of excess reserves has risen from $2 billion to $559 billion.” Banks are not lending out this increased liquidity—partially because of decreased demand and partially because of increased lending standards. Eventually, when these reserves make their way through the banking system, the money supply will increase by a huge amount. Some are forecasting hyperinflation as a result. Clearly the Fed does not want that—in a hyperinflation the very fabric of civilization is destroyed. The Fed is playing a dangerous game, and I find it impossible to forecast when and if the turn—from deflation to hyperinflation—will occur. In 2009, the forces of deflation will not be overcome easily—and we can only hope that they are not overcome easily, since hyperinflation will devastate the economy beyond what we can imagine. Here is one warning—if hyperinflation visits us, the current bull market in treasury bonds will turn out to be the mother of all bubbles. Be on the alert for the turning point in interest rates. Healthcare: 2009 will represent a transition year; increasing numbers of individuals will begin to realize that the healthcare model that is in place—take no responsibility for your health, eat bad food, don’t exercise, and then expect to get patched up with a pill or surgery—is no longer sustainable. In a national conversation—forced on us by the economic depression—we will hear about reducing entitlement spending. Although we will begin to realize that there is not an unlimited amount of funds to be spent, in 2009, reactionary forces—those are the forces that demand that government covers everything in healthcare for everyone—will still be on the ascendancy. Economic Ignorance—Again 2009 will mark a transition year; there will be growing interest in conversations about the proper roles of the Fed, of government, and of free markets. As with healthcare issues, this conversation will expand; but the forces of ignorance will prevail. For now, Keynesian nonsense –namely, that you can spend yourself to wealth—is on the ascendancy. Individuals completely ignorant of economics and history tell us time and again that we should not repeat the errors of Herbert Hoover; then they go about replicating the policies of Herbert Hoover and Franklin Roosevelt. In a recent interview, Alice Rivlin, former director of the Congressional Budget Office, was urging consumers to spend. “It doesn’t matter what you spend it on,” she said. The newest Nobel laureate in economics, Paul Krugman, writing in the New York Times took the position that states should not have to keep a balanced budget. “The nation,” he said, “will be reeling from the actions of 50 (the governors of each state) Herbert Hoovers.” When my twins were nine years old, they read Richard Maybury’s Whatever Happened to Penny Candy and they already understood more about economics than Rivlin and Krugman. There will be no end to the economic crisis until this Keynesian nonsense is repudiated in the same way that medicine has repudiated bloodletting. When we look back on 2008, statements such as “(company XYZ) is too big to fail” will be every bit as absurd as anything from the Great Depression. The very idea of the government being powerful enough to “save” corporations in a recognizable form to the benefit of shareholders is simply asinine. It’s roughly the same as declaring a person “too important to die.” Regardless of whether you are flesh and blood or an obsolete organization, there is no bargaining with death. It comes to us all; even if you have the ability to print your own money. Winston Churchill said, “Some regard private enterprise as if it were a predatory tiger to be shot. Others look upon it as a cow that they can milk. Only a handful see it for what it really is—the strong horse that pulls the whole cart.” The good news is that Churchill’s “handful” of people has shrunk to such low levels, that the numbers can only grow from here. Conclusion: Did you ever hear this story? Collectively, we are hanging on to a lot of false beliefs and hoping that we can be saved without letting them go. Fortunately, for the future of the planet, this is impossible. 2009 may be treacherous to our finances, but each of us can still be a “beneficial presence” in the world as we extend a spirit of kindness and generosity to others. When false hope is gone, real change can begin. Who Are the Real Un-Americans? Perhaps my experience is not so different from yours. I have owned four non-Japanese cars—my Chrysler caught on fire while I was driving it, my GM stranded me 300 miles from home on a bitterly cold day, the engine of my Ford had the dangerous habit of turning itself off while I was driving the car, and my Volkswagen blew its head gasket at 12,000 miles. In contrast, my Toyotas and Hondas have never needed more than routine maintenance. Am I biased when I shop for a car? Of course! Am I un-American when I buy a Japanese car? Of course not! Consider the new automobile bailout. Although Senate Republicans have temporarily defeated this measure, President Bush has announced he will spend part of the $700 billion already allocated on such bailouts. We need not revisit again how blatantly unconstitutional such actions will be. In one way it is easy not to get too incensed about the money—it is comparatively small, “only” $14 billion; and we are ready numb to this reckless assault on our economic future. Yet, we all know that this $14 billion is just a small down payment towards many more future payments. How could it be otherwise? If $14 billion was enough to save GM, Chrysler, and Ford, private investors would be rushing to get in on this marvelous bargain. GM and Ford stock have almost approached the penny per stock level; and if the forecasts are correct of those who advocate the bailouts, this would be a tremendous opportunity for investors to get rich. Of course, we know it is no opportunity. Those who promise us a return on our taxpayer investment are either ignorant of the basic laws of economics, or they are lying. They are promoting the interests of a few over the rest of America. We are told that GM, Ford, and Chrysler are victims of a crumbling economy. This is either a confusion of cause and effect or another calculated lie. Their failing businesses are not the effect of a crumbling economy, they are one of the causes. Lew Rockwell has calculated that GM loses about $4000 for every car they sell. Thus, they are a cause of wealth destruction in America. This destruction of wealth was hidden for many years by the cheap credit bubble of the Fed. Left to its own devices, the marketplace will begin a healthy transfer of capital and labor away from failed firms to those firms that can best serve the most urgent needs of the consuming public. This will promote—rather than hinder—an economic recovery. In the 1980s, Japanese cars were imported rather than built in the United States. Perhaps you can remember when Lee Iacocca successfully fought for import restrictions on Japanese cars. He helped to fan racism against Asians, and the quotas helped to push up the price of the average car by $2500. In 1982, in a hate-filled rage, two laid-off autoworkers killed Vincent Chin, a Chinese-American who the men mistook as Japanese. This past Friday, in a Detroit suburb, the tires of five “foreign” cars—a Honda, a Hyundai, a Mazda, a Toyota, and a Volkswagen—were lashed, and “Buy USA” was scrawled on the sides of the vehicles. I put “foreign” in quotation marks because chances are that most of those cars were American-made. Buying a Japanese car built in Tennessee or Kentucky instead of a GM car built in Michigan is no more un-American than buying oranges grown in a grove in California instead of a grove in Florida. The United Auto Workers (UAW) as well as Ford, GM, and Chrysler, would like to confuse us on this point; but we don’t have to believe their self-serving nonsense. Let’s make no mistake about it; automobile bailouts are about supporting firms and unions who are more interested in serving themselves then in serving Americans. It is their selfishness—of course, selfishness is not limited to the automobile industry—that is at the heart of our problems. By selfishness I mean they want to get without giving. The foundation of capitalism is to get by giving. In other words, you earn a profit by satisfying the most urgent needs of the public better than someone else does. Even before there were Japanese auto plants in America, those who bought Japanese cars manufactured in Japan were improving the health of the economy of America. If you doubt that, consider how impoverished America would become if it stopped trading with the world. The results would dwarf the catastrophic effects of all the bailouts to date. Leo Gerard, president of the United Steelworkers, advocated lawlessness last week: “If we have Republicans who oppose us, we are going to take to the streets, we are going to occupy places.” Gerard was referring to a proposed $900 billion “Main Street bailout.” Not content with having helped to destroy the steel industry in America, the unions are now threatening overt criminal behavior. No doubt these threats and actions will become increasingly commonplace as the economic depression, created in part by their previous actions, gains momentum. Kathy Ward works in a Nissan plant in Tennessee. Her pay has been cut this year by about $5000, and she rightfully resents the fact that she will be forced to support UAW members who have refused to take a pay cut. She’s glad she still has a job and wants to see the Nissan plant continue to be prosperous. Unlike her UAW counterparts who have the power to steal from their fellow Americans, she has no such power. Is stealing a strong word? Would you voluntarily send a check to the UAW or Chrysler or Ford or GM? No, I didn’t think so. Steal means “to take [the property of another or others] without permission” and this is exactly what is being done. You would think the choice would be clear—voluntary transactions that raise the well-being of both parties in a trade, such as Honda selling you a new Accord, or involuntary transactions that steal from one group to give to another. America continues to make the wrong choice, and we will all suffer in the process. Those who advocate such theft are the real Un-Americans.